Of course you’ll be taking pictures. Take advantage of a special Photographers’ Hour! Photographers’ Hour: Tuesdays, 8:15 to 9:45 a.m.; tripods and monopods allowed. No screens or backdrops please. Regular ticket fee applies; limited tickets available. Every weekend during the show, orchids are for sale at the Orchid Marketplace. An extra bonus: members of the Illinois Orchid Society offer repotting services on select weekends for the orchids you bring from home. 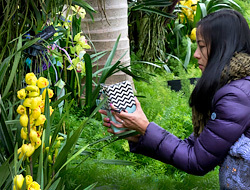 Click here for our video blog about repotting orchids. The perfect gift: a mini orchid from our Garden Shop! Don’t miss the orchid pots, books, and jewelry—and our exclusive line of orchid-illustrated home accessories and kitchenware. Ask the Illinois Orchid Society all of your orchid questions; society orchid experts will be on hand every weekend during the Orchid Show. The society will hold its annual spring show of judged orchid displays in Nichols Hall. Saturday, February 16, 1 – 3 p.m.
3 Sundays, February 24 – March 10, 8 – 11 a.m.
Thursday, March 7, 6 – 8p.m. Friday – Sunday, March 8 - 10, 9 a.m. – 4 p.m.